"the city's [London, that is] coolest new Chocolatier"
"the cool minimalism of Melt, an elegant lab-like boutique in London's Notting Hill that looks more like a branch of Space NK than a bonbonnerie"
"The coolest new shop in Londons Notting Hill is Melt...the chocolate advisor can have anything custom made." "..the chic Ledbury Road boutique dishing out develish organic truffles and swoon-worthy hot chocolate shots. Here chocolates lovers young and old can watch the chocolatiers in action, going wobbly at the knees as molten chocolate dribbles across stark marble tabletops." Enough quoted, lets get down to what I think. The shop was very impressive, the presentation gorgeous. The chocolate is Out of this world! Delirious! Booom! Luscious! Appetizing! YUMMY! Enticing! Divine! KABAAM! Four blocks of dark chocolate to stir into hot milk to make a delicious hot chocolate. 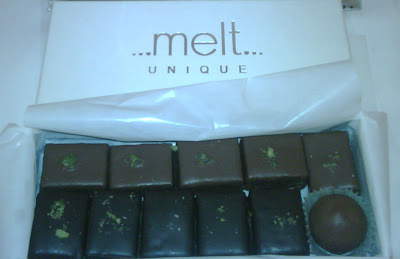 Square dark/milk chocolate with pistachio marzipan and milk/white velvety chocolate ganache filling. A classic milk chocolate truffle with smooth and velvety chocolate ganache filling.